When is a house not a home – when it is taken over by remote devices. Okay, maybe we don’t live in a building with a doorman to store packages; we don’t have a locked mailroom and no space for an outdoor locked box on the porch. And we don’t have a barking dog – and we live in the suburbs. So given all that, some trusting people may sign up for Amazon Key, where a background checked delivery person has the ability to unlock the door and put the package inside. Not a chance. Read the Post article (for multiple issues) and note if there is damage to your property, you can’t even sue them. Note that consumers have been surveyed again and again – they don’t want their home to become too smart. Carefully consider the reasons not to sign up – and don’t. Never say 'Find me an XYZ' product. So you know that before home delivery (in whatever form), Amazon is all about shopping. By whatever method you want, in store, by drone, delivered with a key, at home. Maybe you have stood near or own an Amazon Echo. And you know that in addition to its charm at playing music and setting timers and turning the lights on or off, it is a shopping device that wants to get to know you and enable you to find and buy – even when the command is coming from a TV show. One day you ask it a question about a device with the phrase, ‘Find me a ‘Your-product-here’ (and it can be bought from your account and shipped). Would you like to buy it? Say no, and don’t mumble. Is there a problem with such convenience? For starters, knowing so much about you may not be in your interest. Moreover, such convenience begs for competition. But who has the reach to compete with Amazon ($136 billion in revenue in 2016 and average shopper age is 37)? Walmart wants to – and has an edge in some ways. Consider Walmart’s recent business performance ($482 billion in revenue in 2016). 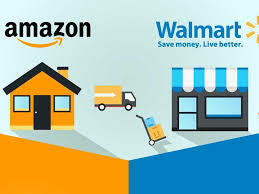 Note that 90% of people in the US live within 10 miles of one of 5000 Walmart stores (average shopper age of 50), so buying online and picking up is feasible and maybe desirable for some products – a lawn mower or power washer, for example. And Walmart.com is doing deals with department stores like Lord & Taylor to carry its brands. Independent bookstores survived Amazon. And grocery stores seem likely to survive. Amazon to Win at Everything? Permalink Submitted by Paul Verchinski (not verified) on Mon, 12/11/2017 - 08:39. Drones = noise at all hours of the day and night. The FAA has changed flights to a GPS/Satillite system which now provides super highways of airplane noise in the sky. More will come with drones since the FAA is seeking exclusive control over airspace below 1,000 feet. Permalink Submitted by Laurie Orlov on Thu, 12/14/2017 - 09:45.